Don't hate me because I infest your cherry trees. Don't hate me because I may eat every leaf on the tree. I will not touch a single flower, you watch. The tree will grow a new batch of leaves and produce a full crop of fruits all the birds will love. Some of those birds will even eat me after bashing me to death on a twig to knock off my hairs. If you burn my tents, everyone suffers, especially the guilty. Me and the cherry trees made a pact a long time ago; who the hell are you? My friend Andrei noticed a link under one of the National Geographic photos that I had overlooked. It described a similar phenomenon at a park in Texas in 2007. 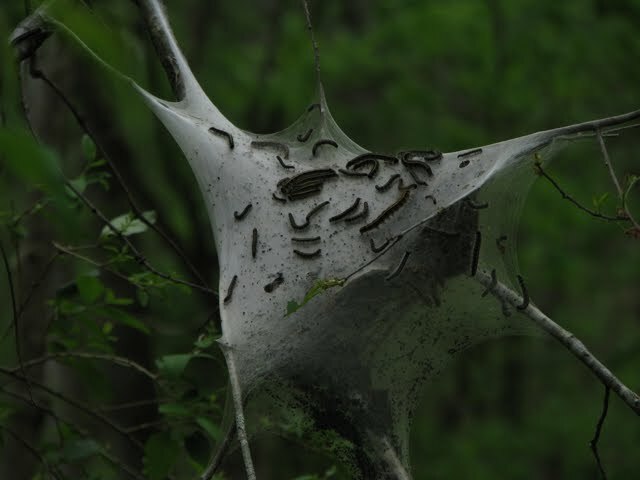 During a wet period and an outbreak of midges and other aquatic and semi-aquatic insects, a tree near Lake Tawakoni became completely enmeshed in spider silk. An arachnologist collected about 100 spiders from the webbing and identified species from 11 different families. The dominant species was Tetragnatha guatemalensis, a fairly common spider distributed throughout the Americas. This family, common name being long-jawed orb weavers, is riparian, typically building horizontal orb webs over water. They exhibit colonial behavior, tolerating neighbors to the extent of sharing thick, foundational silk strands within which they build their daily orb web. None are truly social. Their typical web looks nothing like the sheet webs covering these trees. Research has shown that spiders' aggressiveness diminishes when food is plentiful. In flush times, it's common for a web-building spider to catch more prey than it can consume. What may have happened in Texas and Pakistan is floodwaters drove spiders whose normal habitat is edges of streams and rivers to refuge in trees. When rains subsided and the spiders began to seek places to build webs, flying insects were in such abundance that simple drag lines served as adequate traps. Instead of going to the trouble of constructing orbs, they just wandered around, leaving silk lines as all spiders do, too sated to bother with risky, aggressive interactions with other, similarly situated spiders. The end result was a huge, disordered mass of silk covering entire trees and shrubs. National Geographic published this photo of trees covered in spider silk in Pakistan. This area was ravaged by major floods last year, and as waters receded, these trees became one giant web. According to the article, floodwaters "drove millions of spiders into the trees," but this is highly unlikely. For starters, most spiders are not at all social. Another spider is just something to attack and eat. A tree full of stranded spiders would be a scene of carnage. Secondly, spiders build many different types of webs, but each species builds in a distinct style. These trees are almost surely colonized by a single species, not a collection of flood refugees. There are a few species of social spiders, even one that occurs locally. I've seen their webs along Third Creek. They build a messy glob of silk most spiders would be ashamed of on branch tips over water. They look like the work of caterpillars, and these photos look like cherry trees infested with tent caterpillars. The article includes no photos of the spiders, but I'm sure NatGeo is reliable on that account. My guess is these webs were built by social, riparian spiders. Rather than being driven to the trees by the flood, colonies probably experienced a population boom feasting on flies that feasted on the detritus of the flood. I've long suspected that exhaust from airplanes, by virtue of being released high in the atmosphere, is more problematic than exhaust from cars and trucks. A new study in the prestigious journal Nature confirms that air travel causes more climate disruption, but not for the reason I imagined. It turns out that condensation trails, or contrails, trigger formation of cirrus clouds much like those which form naturally. Cirrus clouds are high, thin and wispy, and they appear when moist air meets temperatures cold enough for ice formation. These clouds trap heat in the atmosphere, and the authors estimate that short-term warming from contrails is about equal to long-term warming from the plane's release of carbon dioxide. The climate footprint of air travel, therefore, is double what you'd calculate looking only at fuel consumption. More study is needed to fully understand the climate impacts of jets, but it's safe to say that we need to view air travel as a luxury, not a convenience. In a gluttonous age, routine air travel may be our biggest indulgence.